At S&SK we love salads! Speaking for myself, I am always looking for unique and interesting grain-based salads. 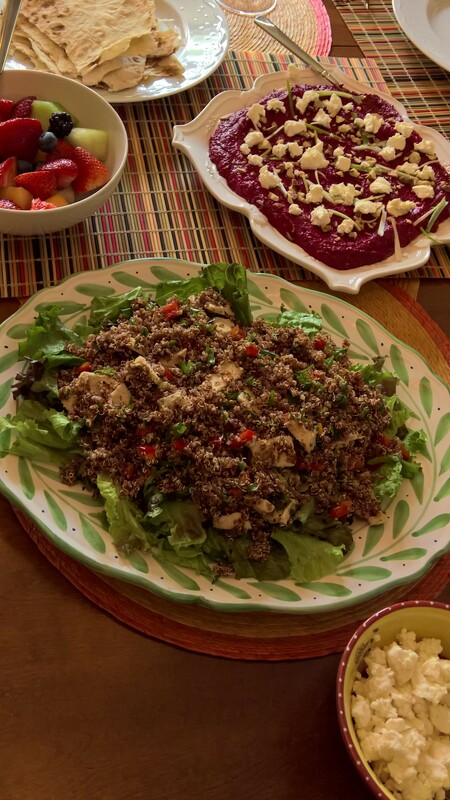 We’ve posted bulgur, couscous and quinoa salads this summer, but this is the first one with rice. I spotted this recipe in the most recent Food & Wine. This seems a little bit like a transition salad from summer to fall – while it has your usual summer ingredient suspects of tomatoes and herbs, it also has dried fruit and nuts and the texture is heavier. 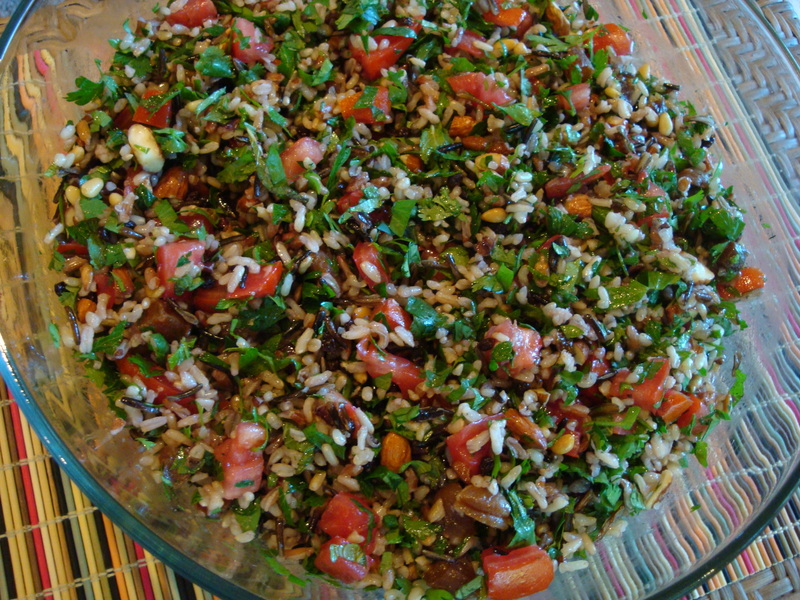 It’s an unusual twist on tabbouleh, containing many layers of flavors and textures. Enjoy! Notes on ingredients and quantities: I used my favorite rice blend, Lundberg’s Wild Blend. 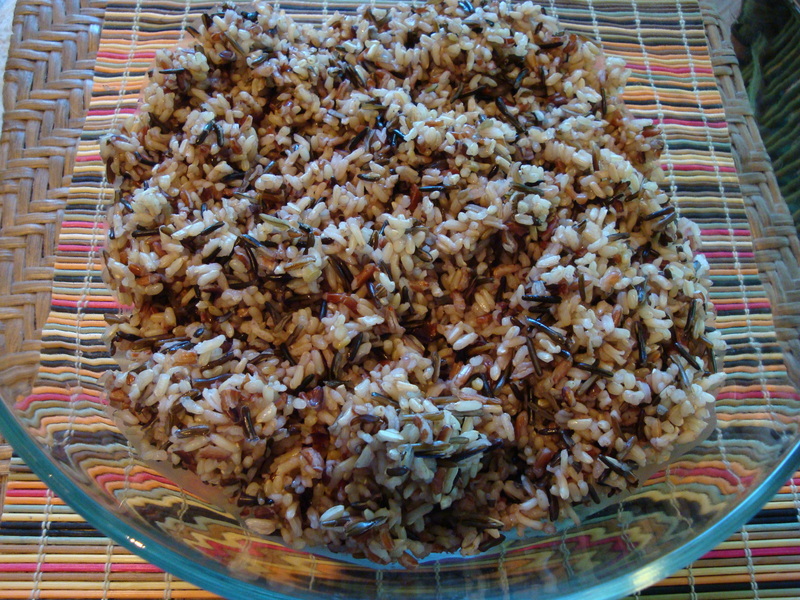 It contains long and short grain brown rice, wild rice, and red and black rice. If the apricots you are using are already soft, skip the soaking. I used the dark, very dry turkish kind, so the soaking was essential. I added currants for a little tartness. While the recipe called for cherry tomatoes, I made it with regular tomatoes which were still going strong at the stand in my neighborhood. This is definitely one of those recipes where you can play around the amounts of each ingredient. I shared the finished product with my friend Joan, and we both agreed it needed something to brighten it up. She added some lime juice. Next time I make this, I will add the zest of a lemon as well as the juice and I think I’ll use those great Spicy and Tangy Roasted Almonds from Trader Joe’s. Cook the rice. Here’s a method that I like to use which I learned from my friend Ruby’s Mom, Rifka, who lives in Bombay and is a great cook! Place the rice in a pan and add the recommended amount of water. When about 2/3 of the recommended cooking time has elapsed, try a grain or two of the rice to test for doneness. If it is “al dente”, drain the rice in a strainer and rinse. Place the rice back in the pan for 10 minutes on low. Turn off the heat and let sit another 10 minutes, then fluff. This method makes for a great, non-gummy end product! Let the rice cool. Soak the apricots and currants in hot water (separate bowls) for 10 minutes. Drain both and coarsely chop the apricots. Place the pine nuts and almonds on a baking sheet and bake at 350 for 5 minutes to toast. Coarsely chop the almonds. Add the herbs to the rice and stir or toss with your hands till all are blended. Then add the fruits, nuts, seeds and tomatoes and stir to blend. Finally, whisk the olive oil and the lemon juice together (and the zest if you are using) and pour over the salad. Stir until completely blended then add salt and pepper to taste. I also think that this could make for a great warm salad by not letting the rice cool completely.